Daniel Keohane and Nate Kenyon, both NEHW members, have stories in the new collection, Rage Against the Night. Keohane’s zombie story, “Two Fish to Feed the Masses” is appearing in “an amazing charity anthology,” he said. 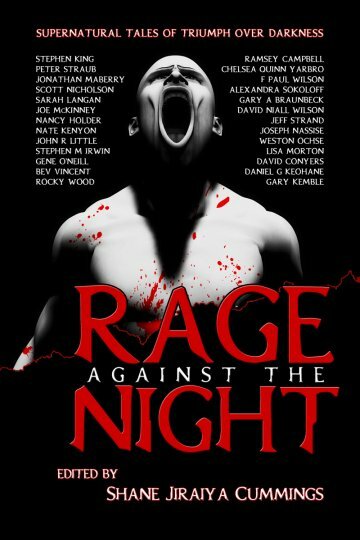 All the proceeds from Rage Against the Night will go to the Rocky Wood, an author and current President of the Horror Writers Association, who is battling motor neurone disease. Amazon states the stories in this anthology detail the brave men and women who stand up to “the darkness, stare it right in the eye, and give it the finger.” These people are under the onslaught of supernatural evil and their good acts can seem insignificant. The anthology was edited by Shane Jiyaiya Cummings and also features stories by Stephen King, Peter Straub, Jonathan Maberry, Ramsey Campbell, F. Paul Wilson, Nancy Holder and Scott Nicholson to name only a few of the authors in this charity collection. Vincent’s story, “The View from the Top” is reprinted in this anthology, he said on his website. As of right now, it is only available in e-book format, but there will be a print copy in January, Vincent said. The e-book is $3.99 through Amazon.